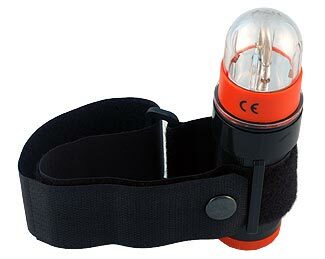 Waterproof to 50 meters, the SL15 Strobe Light is a good choice for boaters and divers. It's also a useful light to have in the trunk of your car for that unexpected nighttime breakdown. Continuous flashing for 8 hours. Velcro arm strap included. Takes 1.5v, C type alkaline battery. Waterproof to 100 meters (300 ft.) Requires two AA batteries. Strobe continuous flashing for 10 hours, torch for 3 hours. Excellent choice for scuba divers. Includes wrist strap. Dual Purpose Strobe Light with gauge reading light. Contents copyright © DIVEmar inc. All Rights Reserved.